Starkinya Vance was seen getting into a silver/gray car around 2 a.m. the morning of November 23, 2006, in Grand Rapids, Kent County, MI. The driver of the car was a tall, black male with a dark complexion and stocky build, and who spoke with an accent. 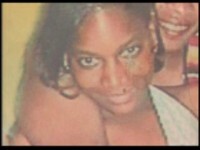 Her body was found later that morning, Thanksgiving Day, 2006, on the southwest side of Grand Rapids. She had been strangled. Posted on Thursday, January 8th, 2009 at 5:24 pm. Last updated on Monday, February 21st, 2011 at 9:47 pm.